Discussion in 'iPad Forum' started by alphaomega16, Dec 14, 2016. Anyone know what the hell is going on here ? Dont know what on earth is going on, ipad has not had any app updates or software updates since I have had it so shouldnt be having any issues. 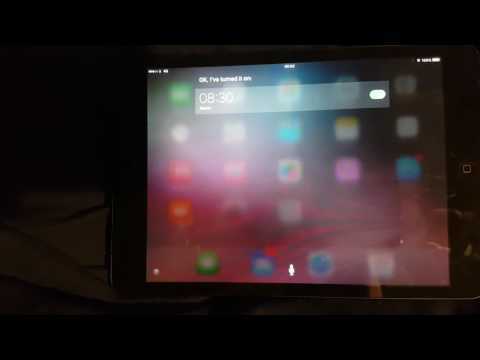 I'm getting the same with my old iPad mini, everything was fine then when I set an alarm via Siri it goes nuts. It's the same with my iPod as well. I'm on iOS 9 without the last update for 9 added on both devices but I wonder if it's a Siri based issue. 9.3.4 here. Must be apple Siri cloud thingy. Don't use the cloud stuff on mine, its disabled. I'm still getting this issue and it's on various forums so we are not alone. This happened out of the blue, not after an update and it seems to be more to do with Apples cloud stuff rather than a bug in the software. I've also noticed Siri always fails on the first attempt at anything be it lights to be turned on or weather. It's now sorted at last. Took Apple ages to solve it and was not an update issue.